This thread initiated because I don't see any Posting Guidelines for ASIF posted anywhere yet. As a start I suggest we look at the Posting Guidelines from another forum, MetaBunk. 1. Don't Post Debunked Bunk - Check first to see if something has been debunked. Don't post it unless you can counter the debunks. 2. Back it up - with links and quotes from reliable source. 3. Be honest - Just go where the facts take you. Don't try to frame something towards a particular point of view. 5. Be Concise. Do not write long rambling posts with multiple asides. Focus on a single claim. 7. Don't Paraphrase. If you want to say what someone said, then quote them exactly. Do not paraphrase what they said. 8. Don't hint or give "clues". Speak plainly. Don't make people guess what you mean. 9. Avoid Promoting Bunk. Don't post links to something unless it's being taken seriously by people open to reason. Very marginal claims are best ignored - don't give them traffic. 10. Be sensitive. Don't post photos of dead, injured, or grieving people unless there's a good reason. Imagine they were your relative, how would you feel about their photo being posted in this context? 11. Use English. This is an English language site. Do not use other languages unless needed while discussing the translation of something. 12. Avoid Humor and Sarcasm. Everyone likes a chuckle, but not everyone recognizes humor. It gets in the way of communication. Just say what you mean. Some are somewhat irrelevant because different type of forum subject. "12. Avoid Humor and Sarcasm. Everyone likes a chuckle, but not everyone recognizes humor. It gets in the way of communication. Just say what you mean. What are the penalties and who enforces them? This thread reminds me of the Moderation rules thread. If I cannot think of the right search term, I won't find where others have thought my thoughts. Although I remember this old thread, it took me half an hour to find it! It says it all, really. Thanks, Tor. 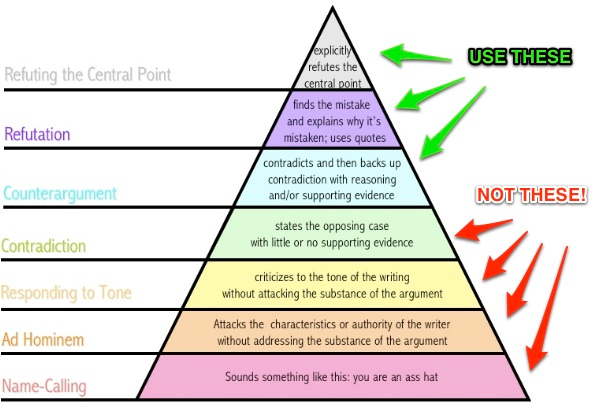 It's a useful reminder and the pyramid is concise and to the point. Doesn't hurt to be reminded. (Though I know, I tend to ramble and go off topic which isn't covered there. And on the political threads, rebunking is endemic. People have their opinions and they're sticking to them. We can all find supportive resources and claim that other people's sources are dishonest or corrupt (the NYTimes, MSNBC, etc.). No about of point by point evaluation gets anywhere, and it is wasteful and time consuming when readers don't want to hear it. I don't think these Posting Guidelines would have to be enforced, nor that there would be any penalties for violating them. It will not be applied evenhandedly. Since censoring the bunk believers is often viewed as impolite and is hence counterproductive, then they will be given more leeway. Debunkers generally have far thicker skins. The bunk believers' insults do not help their case, and so it's not so important to remove them. I will still remove more extreme insults that would derail the conversation. Ultimately it is up to you Neven. This is your forum, and you are the arbiter. But I think that if we all respect these Posting Guidelines, either by reading them ourselves or reminding others of them, that we will improve this forum with more civil conversations with more constructive discussions. Don't know what's happening now in the Policy and Solution section, but it looks like people are getting crazy about general ideas (pro/contra Tesla, energy transition...) instead of discussing the topics. I am also not perfect and I find it difficult to stay at a scientifical/technical level. Don't know how this could be put back on track. We all know that the work to be done may seem impossible, but I believe that we have no choice wo instead of discussing the budget of a car company, we should discuss how to get the job done.